Lyndon Baines Johnson serviced as the 37th Vice President of the United States from 1961–1963 and later served as the 36th President of the United States from 1963–1969. During the period between the assassination of President John F. Kennedy on November 22, 1963 and January 20, 1965 President Lyndon B. Johnson had no Vice President. It was not until after the 1964 presidential election, that re-elected Lyndon Johnson and his inauguration, that Hubert Humphrey would be sworn in as Vice President. Succession at that time was dictated by the Public Law 80-199, the Presidential Succession Act of July 18, 1947, and under the Act, the next in line for the Presidency after the Vice President was the Speaker of the House, then the President pro tempore of the Senate, followed by the Secretary of State, Secretary of the Treasury and so on through the Cabinet, in order of rank. There was no provision for appointing a new Vice President until the ratification of the 25th Amendment to the Constitution on February 10, 1967. When Johnson assumed office following the assassination of President Kennedy, the Speaker of the House was John McCormack of Massachusetts, and the President pro tempore of the Senate was Carl Hayden of Arizona. 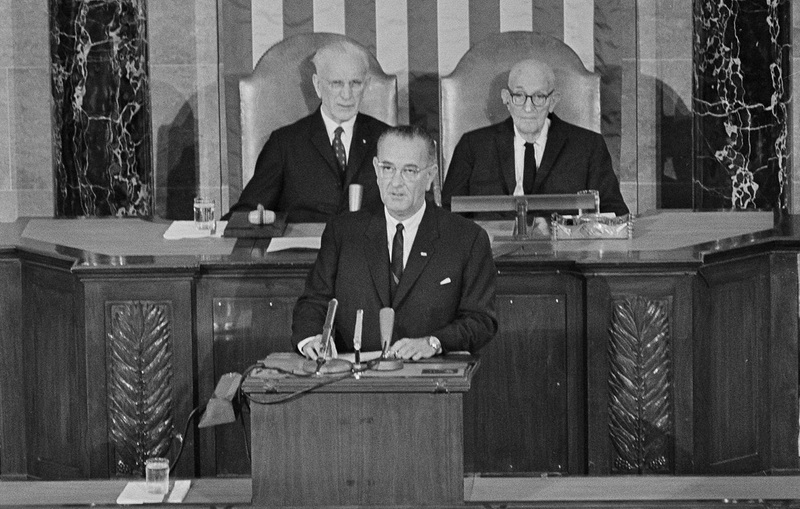 President Johnson addresses a Joint Session of Congress on November 27, 1963, five (5) days after the assassination of President John F. Kennedy. Behind him are Speaker of the House John McCormack and President pro tempore of the Senate Carl Hayden. In 1791, a House committee recommended that this duty fall to the cabinet’s senior member—the Secretary of State. Federalist senators objected because they had no desire to see Secretary of State Thomas Jefferson, leader of the growing Antifederalist opposition, placed so close to the presidency. Others proposed the Senate’s president pro tempore, reasoning that as this official succeeded the vice president in presiding over the Senate, he should also succeed the vice president in performing the duties of the presidency. This plan attracted opposition from those who assumed the president pro tempore would remain a senator while temporarily performing duties of the presidency and feared the arrangement would upset the balance of powers between the two branches. Others suggested the Chief Justice of the United States or the Speaker of the House of Representatives. At an impasse, Congress adjourned for nine months, thereby risking governmental paralysis in the event of presidential and vice-presidential vacancies. Early in the Second Congress, on February 20, 1792, the Senate joined the House in passing the Presidential Succession Act—a compromise measure that placed in the line of succession its president pro tempore, followed by the House Speaker. Years later, in 1886, Congress responded to longstanding uneasiness with this arrangement by removing its two officers from the line of succession and substituting the president’s cabinet members, by rank, beginning with the Secretary of State. On January 19, 1886, President Grover Cleveland signed the Presidential Succession Act. The act specified that in the absence of a President and vice president, heads of executive departments would succeed to the presidency in the order in which the departments were created, starting with the secretary of state. Vice President Thomas Hendricks died in his Indianapolis home in November 1885. President Grover Cleveland’s message to Congress on December 8 regarding the death of the new vice president called for a constitutional amendment to clarify the line of succession should both the President and vice president die or become unable to serve. While the Presidential Succession Act that was proposed and passed shortly afterward on January 15, 1886, was primarily the work of the Congress, President Cleveland supported the legislation and signed the bill into law. In 1792, Congress had passed a law that addressed presidential succession; the law stipulated that if the President and vice president should both be unable to serve, the President Pro Tempore of the Senate would take office, followed by the Speaker of the House. The Presidential Succession Act changed the previous legislation by placing in line for the presidency, after the vice president, the heads of each executive department in the order in which the department was created. The new system provided a long list of successors, making it all but impossible for the nation to be without a chief executive. Congress changed the law again in 1947, when it was argued that those at the top of the list for presidential succession should be elected, not appointed, officials. Throughout most of the nineteenth century, the Senate assumed it was empowered to elect a president pro tempore only during the absence of a vice president. But what should senators do at the end of a session? Since Congress was customarily out of session for half of each year, what would happen in that era of high mortality rates if both the president and vice president died during the adjournment period and there was no designated president pro tempore? For decades, the Senate relied upon an elaborate charade in which the vice president would voluntarily leave the chamber before the end of a session to enable the Senate to elect a president pro tempore. Fearing that the presidency might thus accidentally slip into the hands of the opposition, vice presidents occasionally refused to perform this little courtesy when the opposing party held the Senate majority. In 1886 Congress replaced the two congressional officials in the line of succession with cabinet officers, in the order of their agencies’ creation. Proponents of this change argued that the Senate elected its presidents pro tempore based on parliamentary rather than executive skills. No president pro tempore had ever served as president, while six former secretaries of state had been elected to that office. When the 1945 death of Franklin Roosevelt propelled Vice President Truman into the presidency, Truman urged placing the Speaker, as an elected representative of his district, as well as the chosen leader of the “elected representatives of the people,” next in line to the vice president. Since one could make the same argument for the president pro tempore, Truman’s decision may have reflected his strained relations with 78-year-old President Pro Tempore Kenneth McKellar and his warm friendship with 65-year-old House Speaker Sam Rayburn. After all, it was in Rayburn’s hideaway office, where he had gone for a late afternoon glass of bourbon, that Truman first learned of his own elevation to the presidency.